Regularly maintaining and inspecting your power steering system and its components can help you spot trouble signs early before they become big problems. That way you don’t encounter steering wheel lock. Since each car is different, as some have electric power steering and others do not, fixing each problem that may arise will be different; however, here are basic steps everyone can take to determine the problem. If you notice a problem when your car turns, or if the wheel won’t turn, it’s time for power steering repair. The first step is for you to diagnose the cause. You’ll want to check your power steering fluid to make sure it’s full and inspect components to check for damage. Further, you may conclude you need to replace your steering wheel. To do this, you will need a steering wheel puller. A steering wheel puller assists you in removing your steering wheel from the column. It accomplishes this by attaching itself to the center hub and removing the screw to release the wheel from the column. 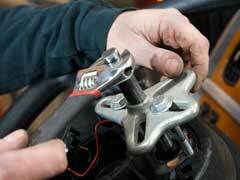 While many auto part stores sell a steering wheel puller, it’s doubtful you will use it often. Therefore, be sure to ask around as many stores may allow you to rent one for a small fee. This can save you a significant amount of money instead of buying a part you will use at best sparingly. To use the steering wheel puller you’ll want to place its arms over the central hub. From there, insert the bolts from the kit into the steering wheel. Lastly, tighten these bolts until the steering wheel slides off. This is the easiest way to inspect your steering wheel and replace it. If you have to replace it, look for aftermarket steering wheels, as there is a better selection and they can be the same if not better quality than your factory model. Ultimately, using a puller makes replacing your steering wheel a quicker process. By renting one from an auto parts store you can save time and money, which will get you back on the road quicker.